The Piedmont Basketball Foundation is pleased to announce the inaugural March Madness 3 on 3 Basketball Tournament will be held on Sunday, March 27 from 12 p.m. to 5 p.m. in the Piedmont High School and Middle School gyms. The tournament is open to players of all ages – boys and girls, men and women – and will consist of 6 divisions – Elementary, Middle School, High School, Open, Master’s ( age 40 and up ), and Family. Players may participate in the Family division and another division. Prizes for each division winner include gift certificates to Fenton’s, Mulberry’s , Crogan’s, Park Ave. Bar and Grill,and Sparky’s plus PBBF T-shirts. In addition, there will be a Free Throw Shooting Contest and a 3 Point Shooting Contest. Trophies will be awarded to winners in each division for both shooting contests and Mulberry’s gift cards to runner ups. Registration is now open until March 25 and forms can be downloaded from the PBBF website, www.piedmont-hoops.net. Entry fee for the tournament is $50 per team and includes March Madness T-shirts for each player and registration for both shooting contests. If individuals wish to only enter the shooting contests then the fee is $15 and includes a tournament T-shirt. Teams will consist of a maximum of 4 players with a minimum of 2 Piedmont residents per team. There will be a handicapping scoring system used to evenly balance the different grades and/or gender within each division. Rules for the tournament and contests are posted on the PBBF website. Each team is guaranteed a minimum of 3 games. All proceeds raised from the March Madness events this year will be donated towards the purchase of a ShootAway basketball shooting machine for Morrison Gym. See their site at http://www.shootaway.com Private donations will also be accepted and will be tax-deductible as PBBF is a non-profit organization. 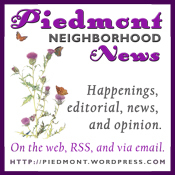 If players are looking to join a team or for more information, contact Don McBirney at don@piedmont-hoops.net . Sign your kid up today for free BBQ! Celebrate the new floor in the Patio Gym, with an afternoon of basketball and barbeque. Sunday, October 26th kids will hoop it up on the new floor in casual games for grades K through 8, while parents, players and friends all enjoy a barbeque and refreshment. A veritable feast of hoops, and a feast with the hoops! As there is a lot going on this weekend, kids are being encouraged to come WHENEVER they can to try out the new floor. Parents, too. While the kids are playing, the BBQ will be grilling and the conviviality will be flowing all afternoon! All kids signed up by October 22nd get their food and beverage free. So RSVP by visiting http://piedmont-hoops.net/ and clicking on “comments” to the HoopFeast blog posting. And thanks to the Piedmont Basketball Foundation, the City and Schools for the new Patio Gym Floor.